As women, sometimes we fall out of belonging in our lives. Or at times desire for a fresh perspective that will evoke a new direction or renewed approach to our lives. Other times we need to be heard and witnessed with a warmth and protection that might not be present for us in our everyday life. Perhaps we need to name the geography of our life's landscape and the territories that exist there, both discovered and undiscovered. There may be moments of coming into our calling or feeling called to something in our lives that beckons us for ritual and a circling of support. This spring, we're breaking new ground and offering our first ever Women's Retreat. 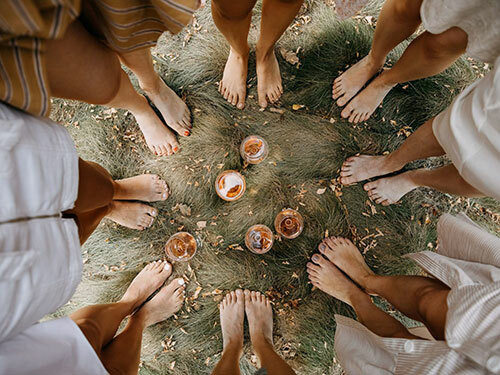 The Women's Retreat is a time for stepping into the gathering place of one's body, heart and soul with all of its creative tension, generosity and promise of longing. Mystery, intuition, receptivity, the dawning of imagination, creativity and inner wildness are but a few of the tools for this adventure. We have many constellations of experience inside ourselves. The Women's Retreat is a ritual encounter with being who we really are with all of those revolving stars. A rare opportunity for you to put a stake in the ground for naming your truths and embracing your wholeness, giving way to a wider and wilder way of being. I invite you to consider this journey to wholeness. Click here to learn more.